Melt the chocolate in a double boiler after having chopped coarsely. Blend finely the nuts and add the cornstarch. Remove from the water bath the bowl with the melted chocolate and stir in margarine. Stir until mix it completely. Put in double boiler and shortly afterwards, stirring constantly, add the hazelnut liqueur, flour and cornstarch. Remove from water bath and let cool. Pour the sweet cocoa powder in a bowl. Take the mixture, which should be almost cold, with the spoon and drop in cocoa powder. 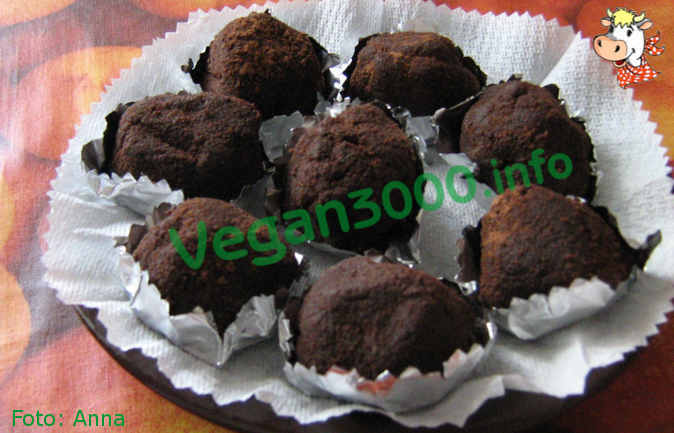 Round or irregular dates as are truffles. Put each truffle into a pirottina and end of packaging transfer everything in the fridge until ready to serve: the truffles will harden.